We want to make images that mean something to you. Our style is story driven. That means hands off, relaxed and focused on the natural flow of your day. We’ll always put that first, and give you space to be present with the people you love. Space doesn’t mean we’ll stand far off with the biggest lens you’ve ever seen, removed from the atmosphere of your day. We’ll be close by, mixing with your nearest & dearest and immersing ourselves right where your story unfolds, so that when you look back at your images you’ll be reminded of what it felt like to be there. That’s everything. Pre-wedding consultation to get to know you both and your plans. In-person/Skype/FaceTime/phone/coffee/wine/beer – we’ll make it work! * Please get in touch if you’re planning an elopement, intimate wedding or something different. We may also be able to offer discounts for mid-week and winter weddings. We’re Derbyshire Wedding Photographers but travel is no problem. In fact, we’re used to it. We make frequent visits back to our homeland of New Zealand – a long journey which requires passing through several countries! 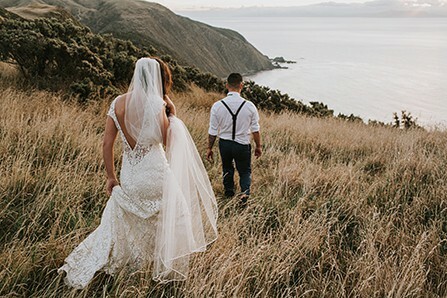 We are more than happy to travel to join you on your big day, and it may not be as expensive as you would imagine – especially if you’re getting married in New Zealand. We go back for long stints over southern summers to see people and shoot weddings while we’re there. And we’ll take any excuse to go home-home so our boys can hang out with their cousins and with Poppy & Gigi (Channie’s folks) and Grandpa & Yaya (Kim’s parents). Please get in touch and we can explore travel options.